The furniture company Swedese and Konstfack (University College of Arts, Crafts and Design) have initiated a collaboration to find new applications for left-over textile materials. The results will be presented in an exhibition at Greenhouse at the Stockholm Furniture Fair 2017. Swedese has a long history of manufacturing furniture in Småland, Sweden. Ever since the time of its founder, Yngve Ekström, the company has done its best to create sustainable production with natural materials, a good work environment and minimal waste. Today, this includes size-specific wood veneers for compression moulding and left-over leather pieces being reused. Swedese always recommends its customers to use upholstery textiles that are environmentally labelled with the EU Ecolabel. 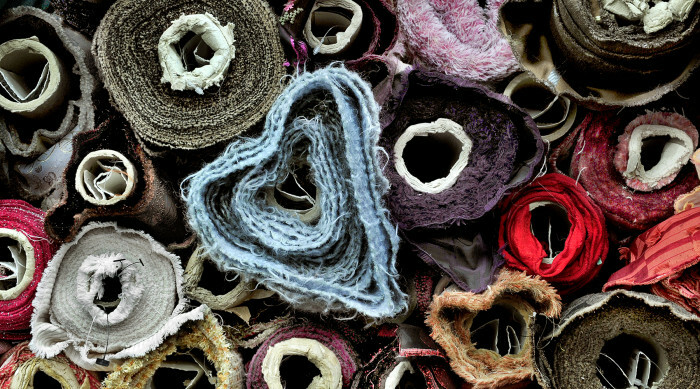 Textile waste is reduced by using modern cutting machines, but even so there is a lot of material remaining. To study how the left-over textiles could be used in a meaningful way, Swedese has initiated a collaboration with Konstfack’s Textile graduate programme. The students in the second year have been given the task of reusing left-over materials from Swedese’s factory in Äng, either to design a product or create a work of art, which could be offered to Swedese’s customers in addition to the furniture. Because Swedese allows its customers to choose the upholstery textiles that will be used, there is large variation in the form and colour of the left-over materials. The students have been given free hands to use the waste materials that are available or to use other materials; however, everything that is used must be environmentally approved according to the requirements set out in Möbelfakta. During the course of the project, the students visit Swedese’s factories in Äng and Vaggeryd to learn more about the company’s manufacturing and environmental efforts. The results of the project will be presented at an exhibition at Greenhouse, the department for not yet established designers, at Stockholm Furniture & Light Fair on 7-11 February 2017. Swedese Möbler AB is a classic Swedish furniture company with strong roots in both domestic and public surroundings. Swedese’s concept is the same today as it was sixty years ago: To create beautiful furniture for the future, starting from a modern Scandinavian tradition. With forward-looking designers who share the timeless idea of the architectonic whole. The company was founded in 1945 by the brothers Yngve and Jerker Ekström as well as Sven Bertil Sjöqvist. The head office is located in Vaggeryd, Småland, where one of the two factories is also located. The second factory is in Äng on the outskirts of Nässjö.